Occurs when conduction of sound through the outer ear or middle ear is disrupted. Some examples include excessive earwax in the ear canal, a hole in the eardrum, and middle ear infection with fluid buildup behind the eardrum. About 10% of hearing losses are conductive, which can range from mild to moderate in severity. Conductive hearing loss can be treated medically, and in many cases can be cured entirely. Originating in the inner ear referred to as sensorineural hearing loss or "nerve loss". About 90% of hearing losses are sensorineural, commonly caused by damage to the inner hair cells. Once damaged, hair cells can't be repaired or restored. Sensorineural hearing loss most often occurs from genetic factors such as family inheritance, excessive noise exposure, or changes in the inner ear due to the natural aging process. Sound can be blocked in multiple places along the path to the brain. 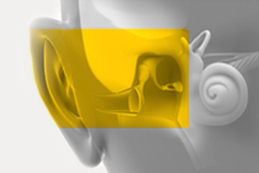 When a hearing loss occurs from conditions in the inner ear as well as the outer or middle ear, it is called a mixed hearing loss because it is a combination of conductive and sensorineural components. An example of a mixed hearing loss may be someone with inner ear hair cell damage due to noise damage who at the same time has an ear infection which is stopping the eardrum from vibrating normally. The conductive portion of a mixed hearing loss can often be medically treated, but even after successful treatment there will still be an underlying sensorineural hearing loss which is permanent and may warrant a hearing aid depending on the level of severity.